Erdogan campaigned hard, portraying Sunday's vote for mayors and district councils as a fight for the nation's survival, but the election became a test for his Justice and Development Party (AKP) after Turkey slipped into a recession for the first time in a decade. The opposition CHP party candidate for Istanbul mayor, Ekrem Imamoglu, was leading by nearly 28,000 votes with most ballot boxes counted, Supreme Election Board (YSK) chairman Sadi Guven said. Imamoglu won almost 4.16 million votes while the AKP candidate, former premier Binali Yildirim, won 4.13 million. Both claimed victory in the early hours following a tight race for the country's largest city after results showing them in a dead heat. "We want to start working as soon as possible to serve people," Imamoglu told reporters on Monday. "We want to cooperate with all institutions of Turkey to quickly meet the needs of Istanbul." In Ankara, opposition mayoral candidate Mansur Yavas had 50.89 percent of votes ahead of the AKP's Mehmet Ozhaseki on 47.06 percent, Anadolu state agency reported, with 99 percent of ballot boxes counted. "Ankara has won. The loser in Ankara is Ozhaseki, dirty politics has lost," Yavas told supporters who were waving Turkish flags and setting off fireworks at a celebratory rally. AKP secretary general Fatoih Sahin said the party will appeal in Ankara, saying the gap between the candidates "will narrow down and I believe it will eventually turn into a positive result for us." Speaking to supporters in Ankara after Sunday's polls closed, Erdogan had said the election was a victory for the AKP, which along with its coalition partner, the rightwing Nationalist Movement Party, won more than 50 percent of votes overall. "Istanbul is his heart, it's really important for him, it is the first place they (AKP) started winning," said Ayse Ayata, political science professor at Middle East Technical University in Ankara. "They have retained their 51 percent majority in total, which is very important. Had they not, this would lead into a questioning of their legitimacy." 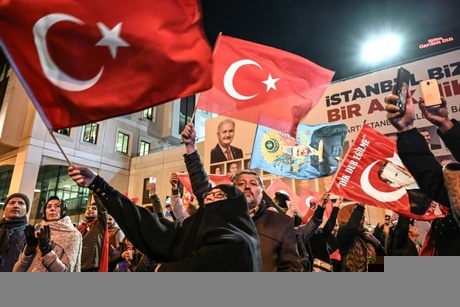 Rights activists and Turkey's Western allies say that democracy has been eroded under Erdogan's leadership, particularly after a failed 2016 coup that led to tens of thousands of people being arrested. Turkey has increasingly come under scrutiny as markets have grown wary of Erdogan's policies. Inflation is in double digits, and foreign currency debt payments are high. The Turkish leader told supporters on Monday that economic reforms will be a focus. His finance minister has already said economic reforms will be announced next week. "Most probably he will emphasize guaranteeing a certain level of economic growth until the next general elections," said Emre Erdogan, a professor at Istanbul Bilgi University and no relation to the president. "Most probably the residents of both metropolitan cities suffered from the economic decline and it has been reflected in the polls."